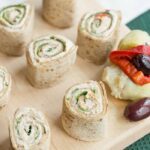 All you need are a few ingredients and leftover rotisserie chicken to make this easy lunch or appetizer. 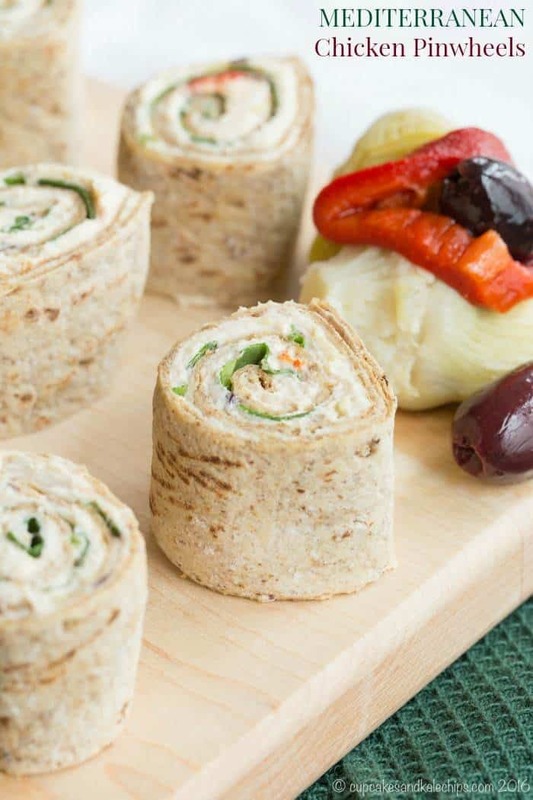 For a simple appetizer or a fun addition to a lunchbox, grab a rotisserie chicken from the grocery store, a copy of 100 Creative Ways to Use Rotisserie Chicken in Everyday Meals from Trish of Mom on Timeout, and make these super easy and tasty Mediterranean Chicken Pinwheels. I’ve talked about “back pocket meals” before – it’s those dinners that you can make when you have no idea what to make for dinner. You don’t have much time, you have the ingredients in the pantry, or you may just need to grab a couple things at the grocery store, and you can make it without even really thinking. Basically, you pull dinner out of your back pocket. Well I’m super excited to tell you about a cookbook with one hundred future back pocket meals. It’s 100 Creative Ways to Use Rotisserie Chicken in Everyday Meals from Trish Rosenquist, the woman behind the blog Mom on Timeout. Trish’s sweet treats, like her To Die For Carrot Cake and Pastel Mint Patties are always popular when I share them on my Facebook page, but the woman has a way with chicken too. I know when I grab a rotisserie chicken at the grocery store, I tend to just carve it and give the family some barbecue sauce to dip it into. Not Trish. She transforms it into soups, salads, sandwiches, casseroles, pasta dishes, and more. 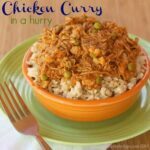 There are slow cooker recipes and super fast recipes that can be done in less time than it takes to watch an episode of Fuller House on Netflix. You wouldn’t even believe the number of little scraps of paper I have shoved into the pages marking the recipes I want to try. Plus not only do they sound delicious, but page after page of gorgeous, mouthwatering photos make these recipes look delicious too. For my gluten free readers, you might not be making all one hundred of the recipes, at least not without some tweaks and modifications. Many of the casseroles call for canned cream soups, there are recipes that use crescent rolls or prepared pizza dough, and there are chapters of pasta and sandwich recipes. But many of the recipes just need a simple swap to gluten free alternatives, and there are still plenty of others to enjoy as-is, like the Salsa Chicken Quinoa Casserole, Spicy Mango Chicken, and even something as fancy-pants as the Chicken Madeira with Roasted Asparagus. 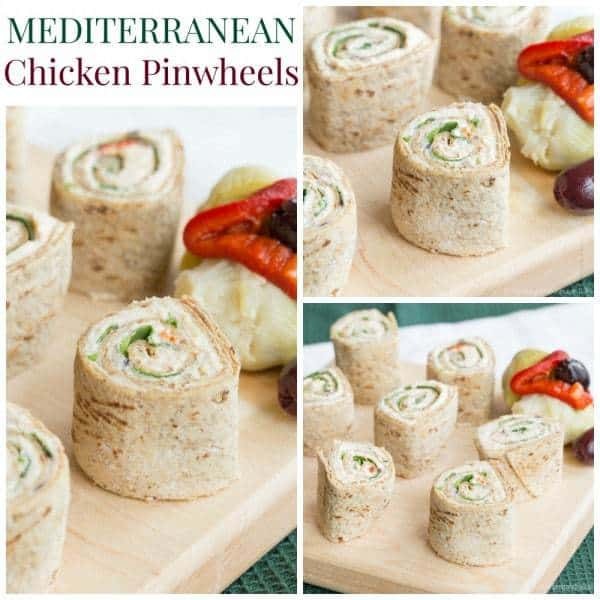 I absolutely loved the filling of these Mediterranean Chicken Pinwheels. It was creamy with the salty, briny punch of the olives, and the slight sweetness of the roasted red peppers. I enjoyed it on some lettuce wraps, but The Hubby and the boys devoured these little pinwheels. 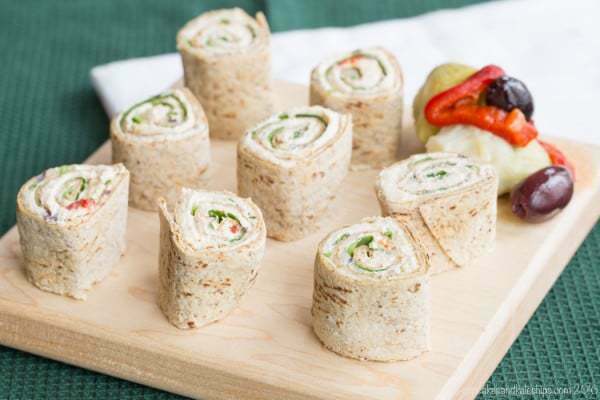 It’s a perfect fun finger food for the kiddos, and rolling something up in a tortilla is a surefire way to get those boys to eat something with flavors that they might typically turn up their noses at. 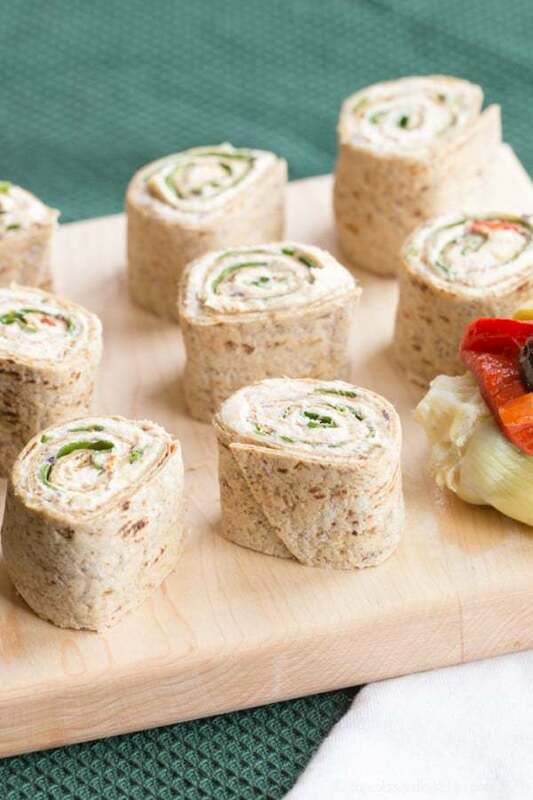 They are perfect for packing in lunchboxes, and you can also make a double batch for a quick and easy party appetizer. 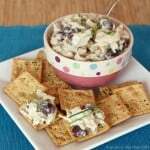 I also love the idea of the chicken and cream cheese base as a starting point for adding other flavors and ingredients. So whether you are buying a rotisserie chicken at the supermarket to prep ahead for the week, grabbing on on your way home from work, or maybe you even made a slow cooker roast chicken or a roast chicken in the oven over the weekend, once you have this cookbook in your hands, you’ll have plenty of ideas and inspiration to jazz up that same old same old chicken and make something simple and simple fabulous. What is your favorite thing to make with rotisserie chicken? Combine the cream cheese, artichoke hearts, roasted red pepper, olives, and chicken in the bowl of a mixer with the paddle attachment. Turn the mixer onto low until thoroughly combined, allowing the flavors to mix together well. 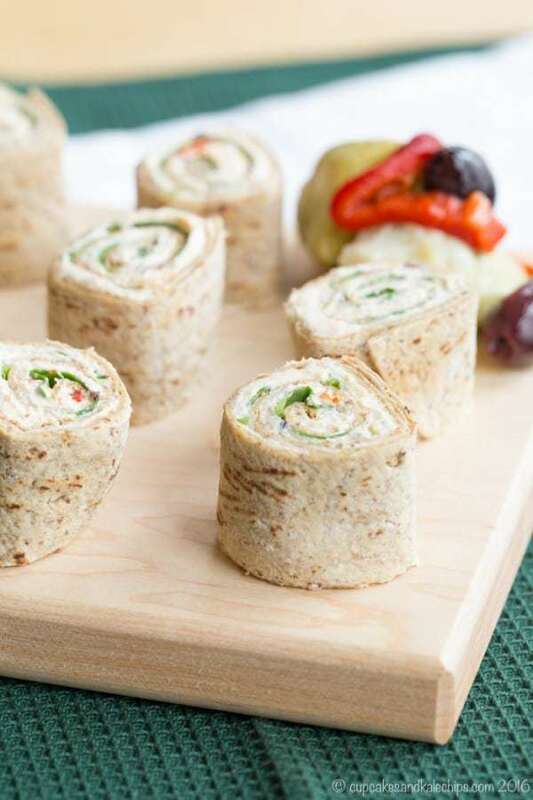 Using about a quarter of the mixture, spread a thin layer on top of one of the flatbreads or wraps and top with baby spinach leaves. 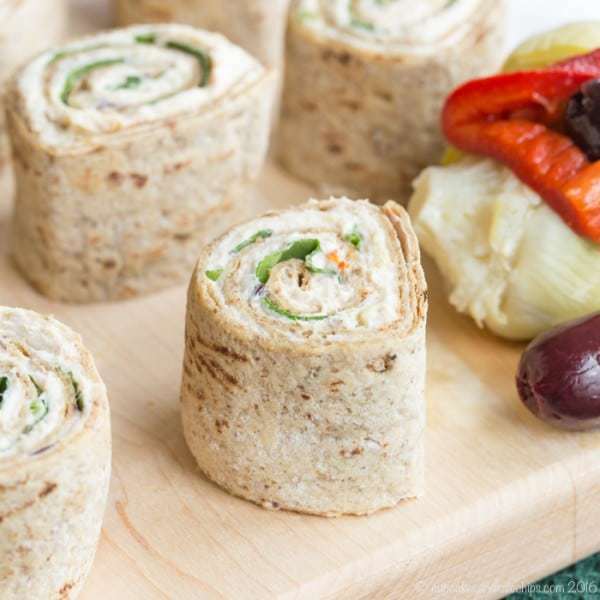 Roll up the flatbread or wrap tightly and cut into six to eight pinwheels. Repeat with the remaining ingredients. Alternatively, for a gluten free or low carb option, spread the chicken mixture inside large lettuce leaves to make lettuce wraps. These look yummy. I will try making them with cottage cheese instead to get more protein and less fat. Yum, These would be perfect to serve at my ladies get to gether next month. Thanks for the recipe. You are the sweetest Brianne! I can’t thank you enough! Mwah! I really love your cookbook! 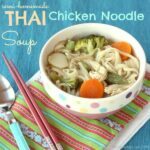 I keep going back to it for simple weeknight meals!